With hundreds of options for shocking your swimming pool or spa, it is often hard to know where to start and where to end. Hopefully, this 10 Best Pool Shock Reviews 2019 and Guide will provide you the right knowledge about what you should do. There are three different types of pool shock on the market today. Calcium hypochlorite is the most popular kind of shock and is the strongest of the three. It dissolves easily, and the sun’s rays burn it off without destabilizing the cyanuric acid level in your pool. Although it is easy to dissolve, you should mix it with water in a container before you add it to your facility. This is to avoid the development of pinholes in your pool or bleach on the surface. The shock increases the pH of your swimming pool and should be added in the evening. Also, resume swimming when the pH has stabilized. This shock dissolves more slowly and comes in a powdered form. It has a stabilizer that raises the cyanuric acid level in your pool. 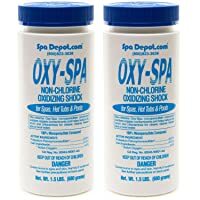 Also, you can use this product as maintenance chlorine or as a shock treatment. Just like the calcium hypocrite shock, this shock increases the pH level of your pool. It should be added in the evening and only swim after the chlorine level has normalized. This shock is based on oxygen which has no chlorine. It is mainly used to oxidize your pool and eliminate contaminants. It allows the chlorine to function better. The product is usually known as “Shock and Swim” since you can add it anytime (day or night) and resume swimming after 15 minutes. This product doesn’t affect the cyanuric acid in your pool. Note: You can get these three shocks in powdered (granular) or liquid form. 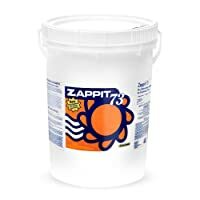 What is the best pool shock to buy? When you use a liquid pool shock, there is almost a zero chance that you will destroy your pool or even the liner. With a powdered brand, there is a high chance that you will damage your pool if you are not careful. A cement pool won’t be destroyed by a powdered pool shock, but there is a possibility that there will remain large quantities in some areas. Hence, you need to use a brush to move it around so as to dissolve it completely. Alternatively, you can pre-mix the powdered pool shock with water to avoid these challenges. A liquid shock is an effective and safer option while a powdered model is effective and won’t cause any harm if added to your pool correctly. Here are the top 10 pool shocks on the market today. This pool shock is for use with swimming pools of up to 15,000 gallons. 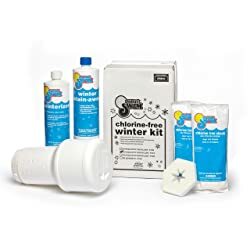 The kit comes with chlorine-free chemicals that won’t bleach your pool’s liners or even stain it. Slow-release setting floaters ensure that your pool is oxidized throughout the winter. And the packet includes 1 winter pool floater, 2 lbs. chlorine-free shock, among other things. The kit is highly effective. Pool Essentials Shock Treatment is an economic shock for all types of swimming pools. It is designed for stress-free application through your pool skimmer. Alternatively, you can apply it directly into the deepest part of your pool. As well, it is perfect for using any moment during the season. The product is especially perfect for algae infested pools. That’s mainly due to trichloro-s-triazine trione, the active element in the shock. In The Swim Pool Closing Chemical is for use with a pool of up to 35,000 gallons. The product doesn’t bleach or stain your pool liners and uses chlorine-free chemicals. Just like the 15000 gallons Closing Kit from In The Swim, this shock has a slow-release floater that keeps your swimming pool oxidized during the winter. It also includes chlorine-free shock, I winter pool floater, 1 winter sorb, and 1 qt. winter strain-away. 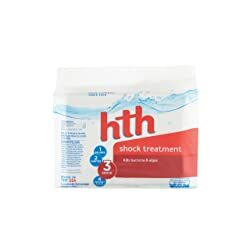 HTH Pool Shock comes in a 6 count 1 pound bag that is effective for shocking your swimming pool. It is a multi-purpose shock that clarifies, sanitizes, shock treats your swimming pool and helps to prevent algae development. Furthermore, it is an easy to use and convenient product that keeps your pool fresh. Another thing is that it doesn’t over-stabilize your spa or pool chemicals. 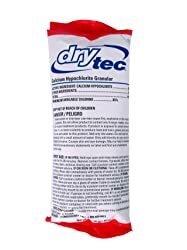 Another great pool shock for treating your swimming pool is this 1-pound product from DryTec. It is a quick-dissolving, fast-acting swimming pool sanitizer that controls algae, kills bacteria, and destroys organic elements in your pool. The product features 68% calcium hypochlorite and the recommended dosage is 1 lb. per 10,000 gallons of a swimming pool. Also, the shock protects your pool for long. The Clorox Pool and Spa Shock is a strong shock that has a lot of extras. It comes in an easy to pour bottle, making it easier to use than a rip open bag. The shock features crystals that kill and prevent blue algae. Additionally, it kills and prevents green, mustard, and black algae, making it good for algae. This shock will also make your facility’s water look clearer. 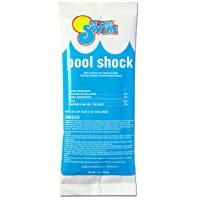 An effective and powerful chlorinated shock product, this In The Swim Shock comes in a 24 x 1 pound bags. It provides a fast chlorine boost when you need immediate action. The other feature of this shock is the 68% calcium hypochlorite that adds to its oxidation. And the best thing, it is recommended for a pool of up to 10,000 gallons. This is yet another pool shock that has made it in our list. The product acts instantly to eliminate hot tub water soaps, natural oils, build-up, and deodorants remain. It easily breaks down contaminants like cosmetic, lotion, and perspiration residue to give you a clean pool. The shock also helps to clear cloudy water and eliminate any odor in your facility and is perfect for salt water pool. The In The Swim 12 x 1 Pound Bags Shock is similar to the 24 x 1 Pound Bags. It is a powerful and effective product that treats your pool within minutes. Additionally, it offers a fast chlorine boost when you require fast-action. That not all, it features 68% calcium hypochlorite for better oxidation and is ideal for a 10,000 gallons pool. Last, but not least, is the Zappit 73% Cal Hypo Pool Shock. This product comes packed in a bucket of 50 pounds. It features fast-dissolving particles that treat your pool within minutes. This is not only a pool shock but also a super chlorinator, thanks to its 70% available chlorine. And what great, the shock is recommended for a 40,000 gallons swimming pool. You shouldn’t wait for a bad odor or itchy skin to happen in order to shock your swimming pool. It is recommended to shock your pool once per week or at least once per week to maintain the ideal water chemistry. Also, the more you use your facility, the more regularly you should shock it. After a damaging wind or severe rainstorm. After a bowel-related pool incidence. After a noticeable water level change. After heavy use, such as a pool party. Think of these chocks as insurances against contaminants and algae. It is better to prevent than to cure. 1.When should I shock my swimming pool? A: Swimming pool shock should be done after the sunset. The reason behind this is that the sun burns off unstabilized chlorine. Therefore, shocking your facility during the night ensures that the chemicals work the way they are supposed to. 2. 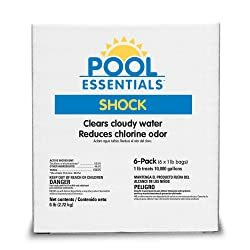 Should I buy shock or chlorine? What is the difference? You should buy shock if you want to shock your swimming pool and not chlorine. Shock is still chlorine but in a concentrated level. Its primary purposes are to shock your facility and increase its chlorine level quickly. On the other hand, normal chlorine is just a sanitizer. Its primary purposes are to keep your swimming pool water clear and healthy. There is no single brand that we can say it is the best pool shock. The best product will be determined by the condition of your pool and what you want to eliminate. With that in mind, the In The Swim Pool Winterizing Closing Chemical Kit – 15K Gallons is a good product for shocking most pools.